CAER researchers are harnessing the power of algae to capture harmful carbon emissions, while simultaneously growing a renewable material or fuel source. Algae does an efficient job of sequestering carbon, taking it out of the air and locking it away in solid biomass. That biomass could, in turn, find use as a raw material for making products or as a renewable fuel itself. Capturing CO2 Emissions from Coal-Fired Power Plants. More than 90 percent of Kentucky’s power comes from coal, which when burned produces carbon dioxide as a waste product. With federally mandated carbon emissions limits on the horizon, the work underway at CAER is more critical than ever. Scientists looking for ways to curb carbon dioxide emissions have taken a keen interest in algae. These simple, plantlike, aquatic organisms — their family includes both pond scum and seaweed — are among the oldest forms of life on Earth. Like plants, they draw energy from photosynthesis, using light from the sun and carbon dioxide from the air. 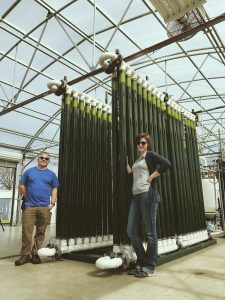 Developed in Partnership with Duke EnergyWith $1.8 million in funding from the Kentucky Energy and Environment Cabinet, CAER is now partnering with Duke Energy to test a pilot-scale algae system at East Bend Station. We are harnessing algae’s ability to grow very fast and perform photosynthesis in order to take the carbon dioxide in flue gas and turn it into biomass. A Modular, Inexpensive Carbon Capture System. Instead of acres of ponds, CAER’s strategy is based on a closed system of photobioreactors to grow algae. CAER’s system, made of plastic tubes and off-the-shelf PVC pipes, is built by UK students and staff and glued together on-site. Expanding the system simply means adding more tubes. The closed system is more efficient, even in winter when sunlight is minimal. It is less prone to contamination, and evaporation is much less of a problem than with ponds. CAER has installed a 5,000-gallon feed tank with two centrifugal pumps on the east side of the power plant, with southern exposure to maximize the sunlight on the tubes. The feed tank serves as the hub, where carbon dioxide and nutrients are added, and where water returns. Algae comes out of the photobioreactors and it goes into the harvest tank, where it settles to the bottom. The algae that comes out is dark green and the consistency of pesto. That material can be fed into an anaerobic digester to produce methane gas that the power plant can burn for fuel. It can be dried and processed into fish food or animal feed. Or it can undergo different processing to be turned into biodiesel, or even jet fuel. Efficient and AffordableCAER’s system, made of plastic tubes and off-the-shelf PVC pipes, is built by UK students and staff and glued together on-site. Expanding the system simply means adding more tubes.